«When we go into a classroom, we put all the desks to one side and sit in a circle. From one side, this exposes us. From the other, it makes us feel like a community. The project uses the language of the Theatre as a tool to make students aware and train them. Up until now, more than 40,000 students have been involved in secondary schools. The show’s actors and trainers coordinate these gatherings, accompanied by university researchers and operators from partner associations. 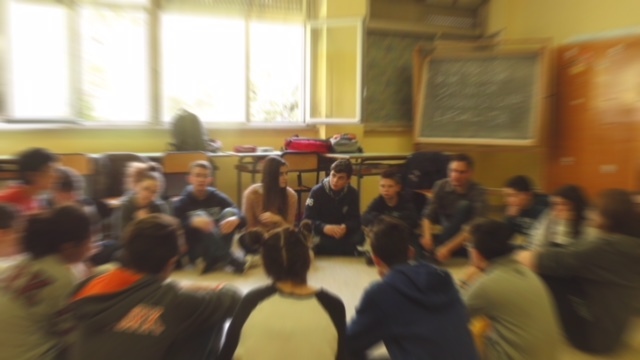 They take on the concept of ethics and the common good with the students, using tools and pedagogical techniques of group games. The positive return of behaviour that respects ethical principles can be highlighted in terms of economic growth and social development. The dramatic aspects that have characterised and continue to characterise the fight against organised crime, whichever formula you use, are compared with examples of success obtained in terms of enterprise, reaction and a region’s economic and social reorganisation. Causes and effects, hypotheses and objectives are also analysed with the students to rehabilitate the community threatened and contaminated by increasingly strong criminal powers. Through roleplaying games, concentration exercises, listening to others, sharing the space and words, the students are encouraged to think rationally about what happens if my private interest becomes the only form of human coexistence and what the alternatives are to this choice. The themes tackled in the show are introduced. After watching Ten stories just like this: third act, the students are asked to reflect and debate directly with the actors, in the presence of witnesses or people involved in the stories told in the play. After having reflected over what they have seen and having matured during the project, then comes the Pay attention! workshop, which aims to make all students observe their own daily conduct, that of their family, in their district, region, in order to make them assume a sense of responsibility and become active citizens. There are group activities, analysing the language and scenery used in the play, introducing themes tackled in the show and stories. The language of the theatre is used as a method of investigating the themes it deals with.